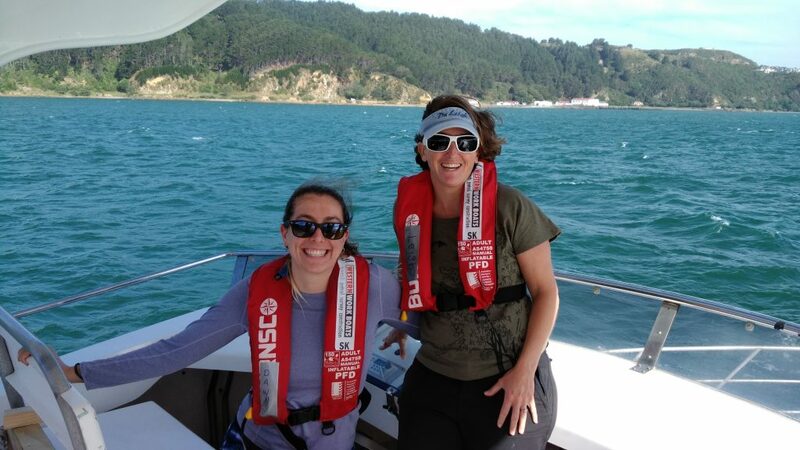 As a PhD student studying the ecology of blue whales in New Zealand, my time is occupied by questions such as: When and where are the blue whales? Can we predict where they will be based on environmental conditions? How does their distribution overlap with human activity such as oil and gas exploration? Leigh and I have just returned from New Zealand, where I gave an oral presentation at the Society for Conservation Biology Oceania Congress entitled “Cloudy with a chance of whales: Forecasting blue whale presence to mitigate industrial impacts based on tiered, bottom-up models”. While the findings I presented are preliminary, an exciting ecological story is emerging, and one with clear management implications. The South Taranaki Bight (STB) region of New Zealand is an important area for a population of blue whales which are unique to New Zealand. A wind-driven upwelling system brings cold, productive waters into the bight , which sustains high densities of krill , blue whale prey. The region is also frequented by busy shipping traffic, oil and gas drilling and extraction platforms as well as seismic survey effort for subsurface oil and gas reserves, and is the site of a recently-permitted seabed mine for iron sands (Fig. 1). 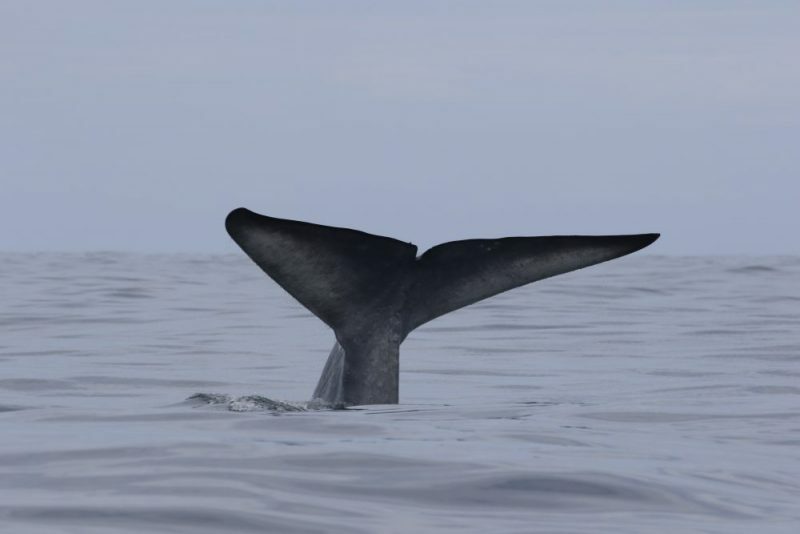 However, a lack of knowledge on blue whale distribution and habitat use patterns has impeded effective management of these potential anthropogenic threats. Figure 1. A blue whale surfaces in front of a floating production storage and offloading vessel servicing the oil rigs in the South Taranaki Bight. Photo by D. Barlow. Three surveys were conducted in the STB region in the summer months of 2014, 2016, and 2017. 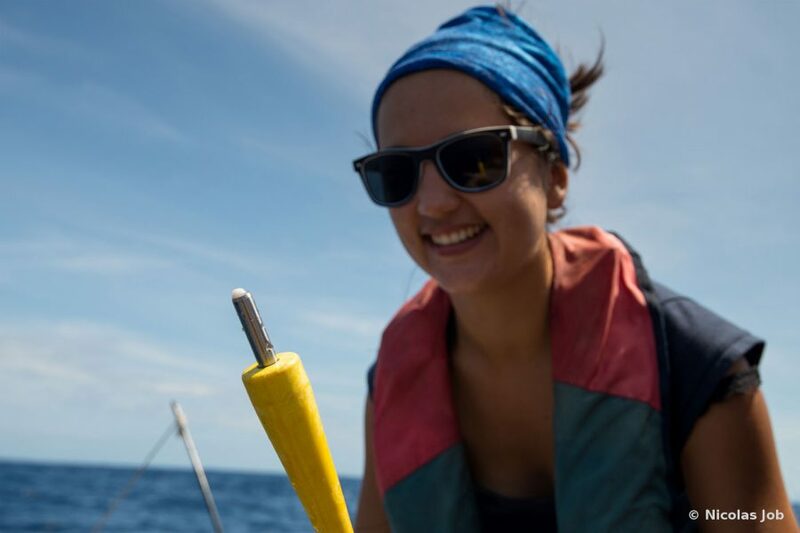 During that time, we not only looked for blue whales, we also collected oceanographic data and hydroacoustic backscatter data to map and measure aspects of the krill in the region. These data streams will help us understand the functional, ecological relationships between the environment (oceanography), prey (krill), and predators (blue whales) in the ecosystem (Fig. 2). But in practice these data are costly and time-consuming to collect, while other data sources such as satellite imagery are readily accessible to managers at a variety of spatial and temporal scales. 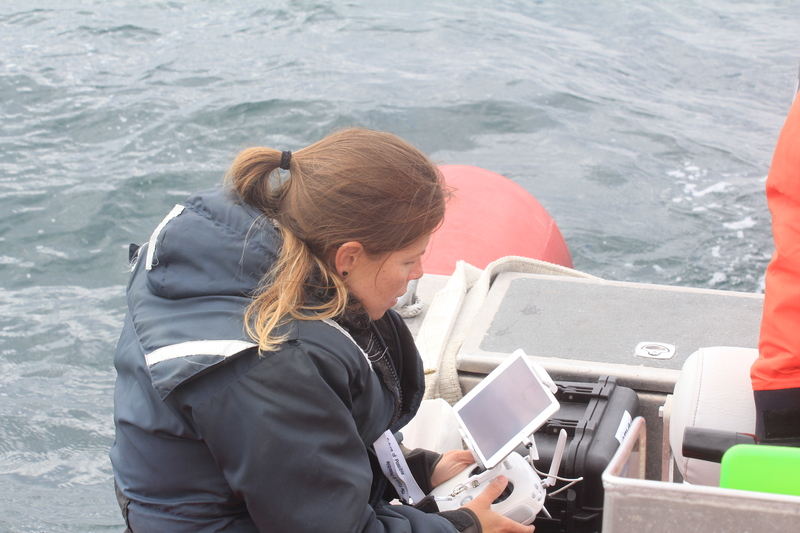 Therefore, another one of my aims is to link the data we collected in the field to satellite imagery, so that managers can have a practical tool to predict when and where the blue whales are most likely to be found in the region. Figure 2. Data streams collected during surveys of the South Taranaki Bight Region in 2014, 2016, and 2017. The majority of the patterns in blue whale distribution can be explained by the density, depth, and thickness of the krill patches. Patterns in the krill are driven by oceanography. Those same oceanographic parameters that drive the krill can be used to explain blue whale distribution. There are tight relationships between the important oceanographic variables and satellite images of sea surface temperature. Blue whale distribution can, to some degree, be explained using just satellite imagery. We were able to identify a sea surface temperature range in the satellite imagery of approximately 18°C where the likelihood of finding a blue whale is the highest. Is this because blue whales really like 18° water? 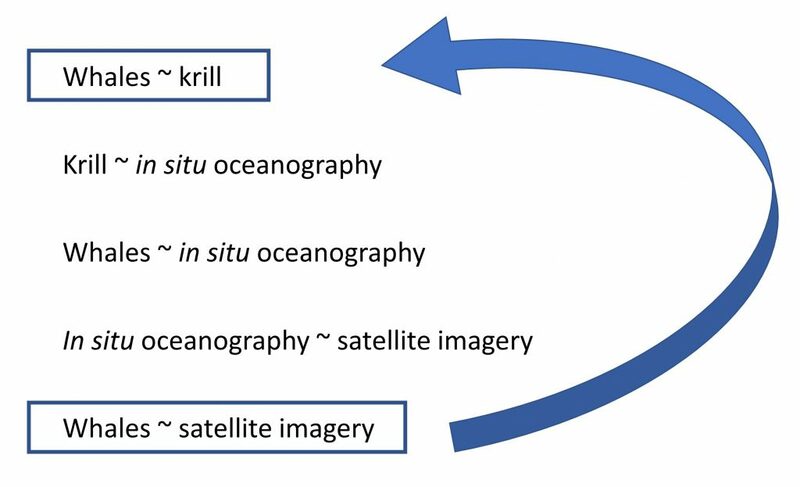 Well, more likely this relationship exists because the satellite imagery is reflective of the oceanography, and the oceanography drives patterns in the krill distribution, and the krill drives the distribution of blue whales (Fig. 3). We were able to make each of these functional linkages through our series of models, which is quite exciting. Figure 3. The tiered modeling approach we took to investigate the ecological relationships between blue whales, krill, oceanography, and satellite imagery. Because of the ecological linkages we made, we are able to say that any relationship between whale distribution and satellite imagery most likely reflects a relationship between the blue whales and their prey. That’s all well and good, but we were interested in testing these relationships to see if our identified habitat associations hold up even when we do not have field data (oceanographic, krill, and whale data). This past austral summer, we did not have a field season to collect data, but there was a large seismic airgun survey of the STB region. 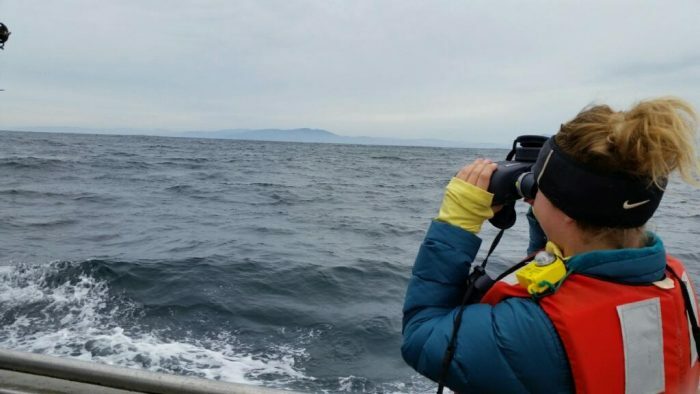 Seismic survey vessels are required to have trained marine mammal observers on board, and we were given access to the blue whale sightings data they recorded during the survey. In December, when the water was right around the preferred temperature identified by our models (18°C), the observers made 52 blue whale sightings (Fig. 4). In January and February, the waters warmed and only two sightings were made in each month. This is not only reassuring because it supports our model results, it also implies that there is the potential to balance industrial use of the area with protection of blue whale habitat, based on our understanding of the ecology. 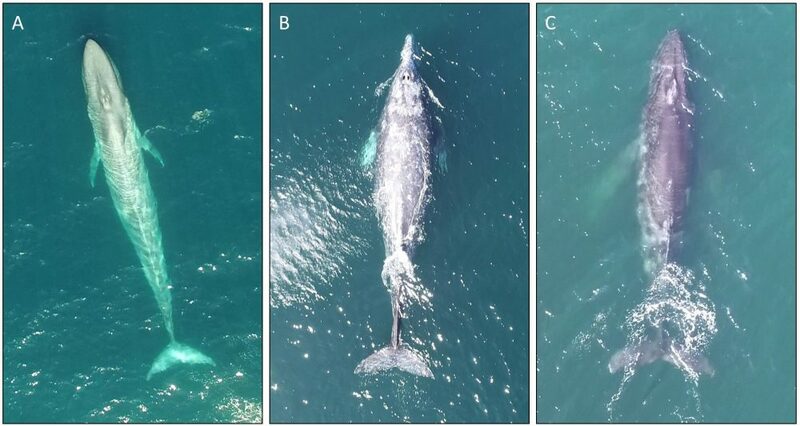 In January and February, very few blue whales were likely disturbed by the industrial activity in the STB, as conditions were not favorable for foraging at the location of the seismic survey. 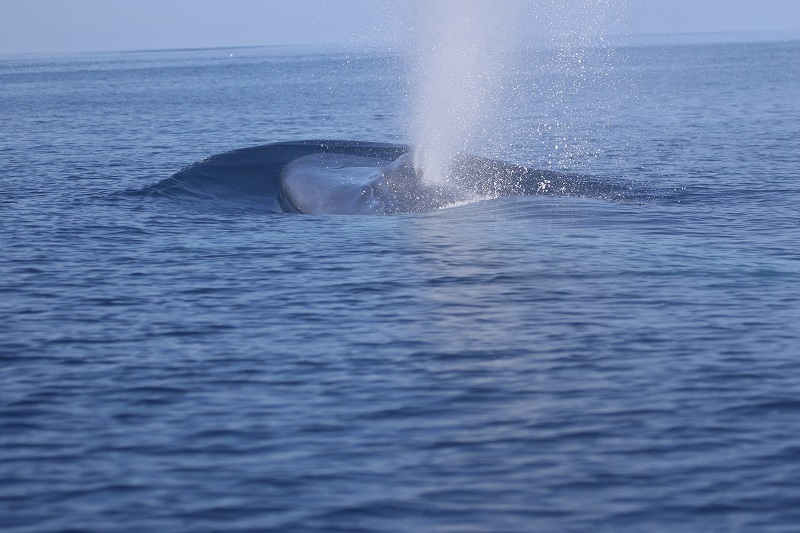 In contrast, the blue whales that were in the STB region in December may have experienced physiological consequences of sustained exposure to airgun noise since the conditions were favorable for foraging in the STB. In other words, the whales may have tolerated the noise exposure to gain access to good food, but this could have significant biological repercussions such as increased stress . Figure 4. Monthly sea surface temperature (MODIS Aqua) overlaid with blue whale sightings from marine mammal observers aboard seismic survey vessel R/V Amazon Warrior. Black rectangles represent areas of seismic survey effort. Blue whale sighting location data were provided by RPS Energy Pty Ltd & Schlumberger, and Todd Energy. In the first two weeks of July, we presented these latest findings to managers at the New Zealand Department of Conservation, the Minister of Conservation, the CEO and Policy Advisor of a major oil and gas conglomerate, NGOs, advocacy groups, and scientific colleagues. It was valuable to gather feedback from many different stakeholders, and satisfying to see such a clear interest in, and management application of, our work. Dr. Leigh Torres and Dawn Barlow in front of Parliament in Wellington, New Zealand, following the presentation of their recent findings. What’s next? We’re back in Oregon, and diving back into analysis. 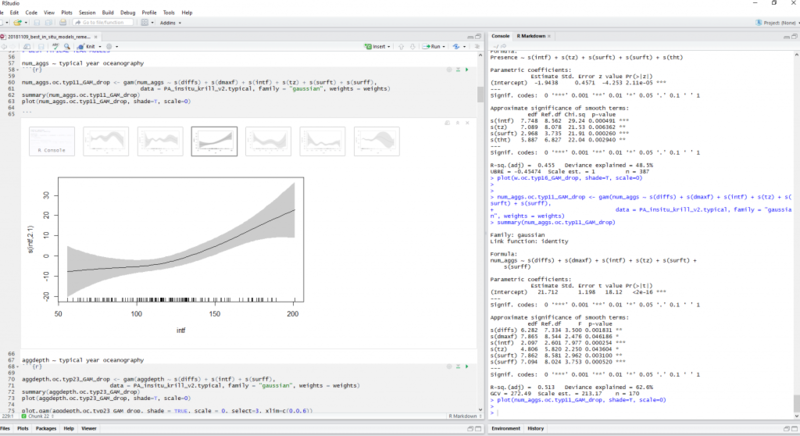 We intend to take the modeling work a step further to make the models predictive—for example, can we forecast where the blue whales will be based on the temperature, productivity, and winds two weeks prior? I am excited to see where these next steps lead! For years, I have said I want to do “applied conservation science”. As an undergraduate student at Pitzer College I was a double major in Biology and Environmental Policy. While I have known that I wanted to study the oceans on some level my whole life, and I have known for about a decade that I wanted to be a scientist, I realized in college that I wanted to learn how science could be a tool for effective conservation of the marine ecosystems that fascinate me. Answering questions during my public defense seminar. Photo by Leila Lemos. Just over a week ago, I successfully defended my MS thesis. 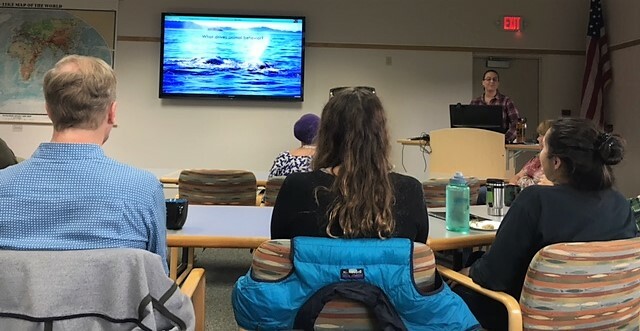 When Leigh introduced me at the public seminar, she read a line from my initial letter to her expressing my interest in being her graduate student: “My passion for cetacean research lies not only in fascination of the animals but also how to translate our knowledge of their biology and ecological roles into effective conservation and management measures.” I believe I’ve grown and learned a lot in the two and a half years since I crafted that email and nervously hit send, but the statement is still true. My graduate research in many ways epitomizes what I am passionate about. I am part of a team studying the ecology of blue whales in a highly industrial area of New Zealand. Not only is it a system in which we can address fascinating questions in ecology, it is also a region that experiences extensive pressure from human use and so all of our findings have direct management implications. 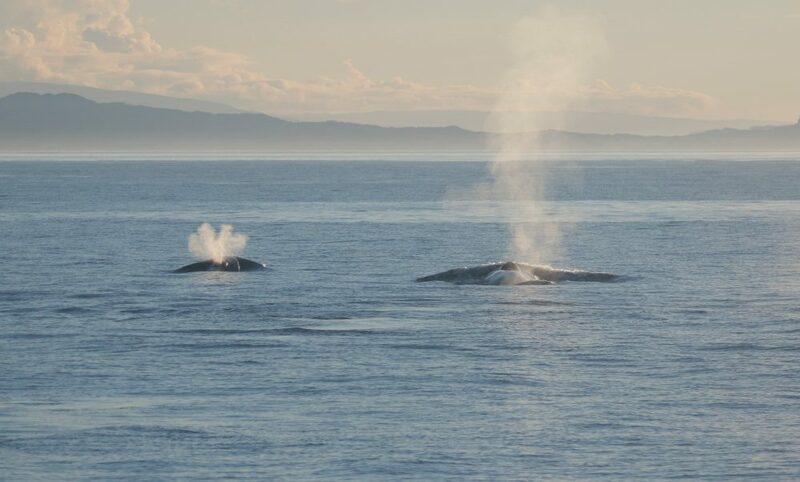 We recently published a paper documenting and describing this New Zealand blue whale population, and the findings reached audiences and news outlets far and wide. 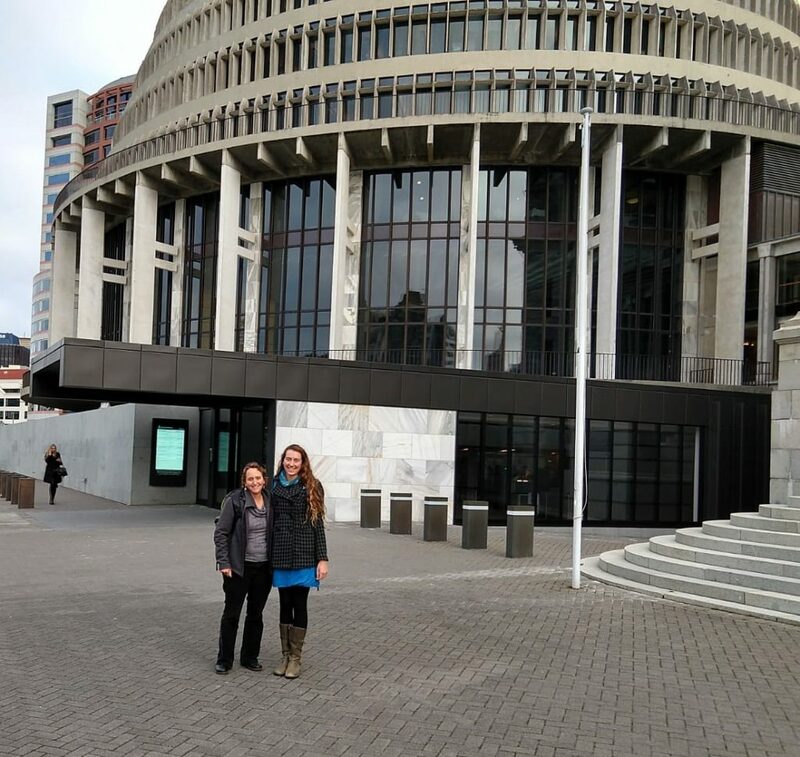 Leigh and I are headed to New Zealand for the first two weeks in July. During this time we will not only present our latest findings at the Society for Conservation Biology Oceania Conference, we will also meet with managers at the New Zealand Department of Conservation, speak with the Minister of Energy and Resources as well as the Minster of Conservation, meet with the CEO and Policy Advisor of PEPANZ (a representative group of oil and gas companies in New Zealand), and participate in a symposium of scientists and stakeholders aiming to establish goals for the protection of whales in New Zealand. Now, “applied conservation science” extends well beyond a section in the discussion of a paper outlining the implications of the findings for management. 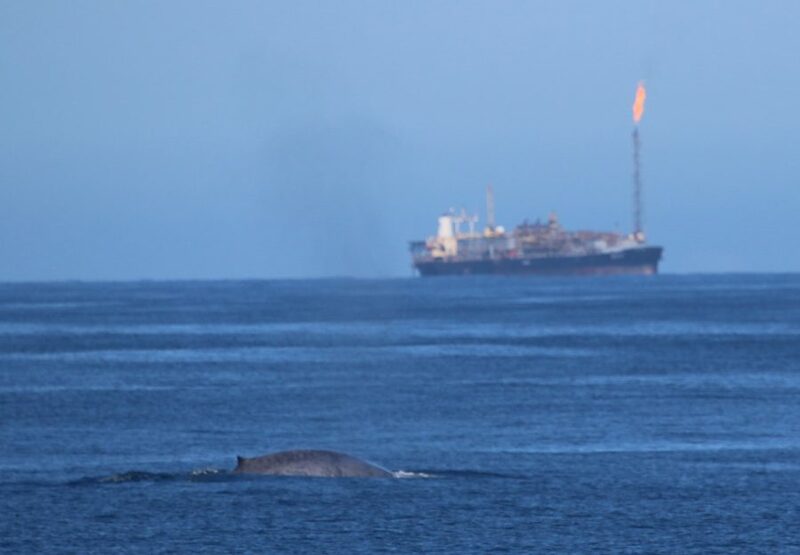 A blue whale surfaces in front of a floating production storage and offloading (FPSO) vessel servicing the oil rigs in the South Taranaki Bight. Photo by Dawn Barlow. During our 2017 field season in New Zealand, Leigh and I found ourselves musing on the flying bridge of the research vessel about all the research questions still to be asked of this study system and these blue whales. How do they forage? What are their energetic demands? How does disturbance from oil and gas exploration impact their foraging and their energetic demands? Leigh smiled and told me, “You better watch out, or this will turn into your PhD.” I said that maybe it should. Now I am thrilled to immerse myself into the next phase of this research project and the next chapter of my academic journey as a PhD student. This work is applied conservation science, and I am a conservation biologist. Here’s to retaining my passion for ecology and fascination with my study system, while not losing sight of the implications and applications of my work for conservation. I am excited for what is to come! Dawn Barlow and Dr. Leigh Torres aboard the R/V Star Keys during the 2017 blue whale field season in New Zealand. Photo by Todd Chandler. In 2013, Leigh first published a hypothesis that the South Taranaki Bight region between New Zealand’s North and South Islands is important habitat for blue whales (Torres 2013). Since then, we have collected three years of data and conducted dedicated analyses, so we now understand that a unique population of blue whales is found in New Zealand, and that they are present in the South Taranaki Bight year-round (Barlow et al. in press). 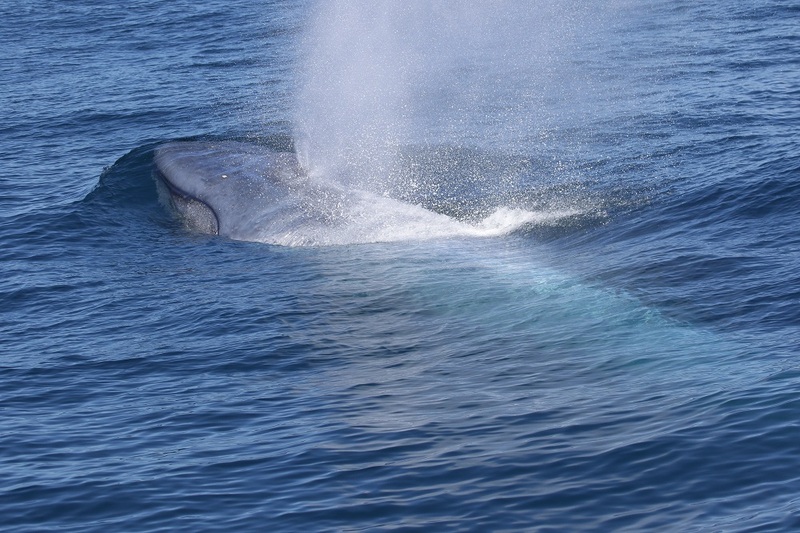 A blue whale surfaces in the South Taranaki Bight. Photo by Leigh Torres. This research has garnered quite a bit of political and media attention. A major platform item for the New Zealand Green Party around the last election was the establishment of a marine mammal sanctuary in the South Taranaki Bight. 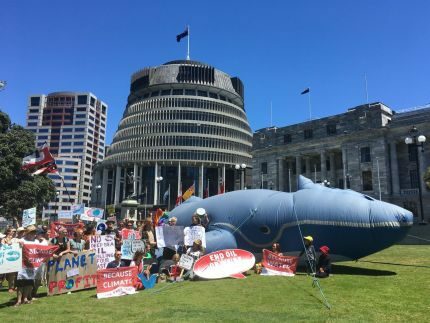 When the world’s largest seismic survey vessel began surveying the South Taranaki Bight this summer for more oil and gas reserves using tremendously loud airguns, there were rallies on the lawn in front of Parliament featuring a large inflatable blue whale that the protesters affectionately refer to as “Janet”. 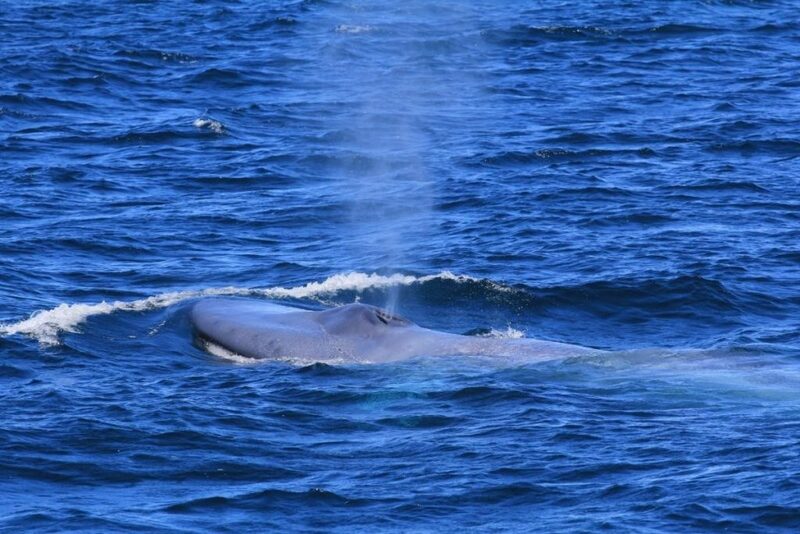 Needless to say, blue whales have made their way into the spotlight in New Zealand. Janet the inflatable blue whale accompanies protesters on the lawn in front of Parliament in Wellington, New Zealand. Image credit: Greenpeace. Now that we know there is a unique population of blue whales in New Zealand, what is next? 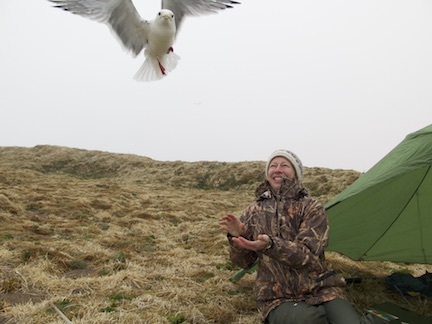 What’s next for me is an exciting combination of both ecology and conservation. If an effective sanctuary is to be implemented, it needs to be more than a simple box drawn on a map to check off a political agenda item—the sanctuary should be informed by our best ecological knowledge of the blue whales and their habitat. In July, Leigh and I will attend the Society for Conservation Biology meeting in Wellington, New Zealand, and I’ll be giving a presentation titled “Cloudy with a chance of whales: Forecasting blue whale presence based on tiered, bottom-up models”. I’ll be the first to admit, I am not yet forecasting blue whale presence. But I am working my way there, step-by-step, through this tiered, bottom-up approach. In cetacean habitat modeling, we often assume that whale distribution on a foraging ground is determined by their prey’s distribution, and that satellite images of temperature and chlorophyll-a provide an accurate picture of what is going on below the surface. Is this true? 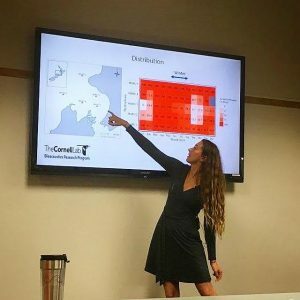 With our three years of data including in situ oceanography, krill hydroacoustics, and blue whale distribution and behavior, we are in a unique position to test some of those assumptions, as well as provide managers with an informed management tool to predict blue whale distribution. What questions will we ask using our data? Firstly, can in situ oceanography (i.e., thermocline depth and temperature, mixed layer depth) predict the distribution and density of blue whale prey (krill)? Then, can those prey patterns be accurately predicted in the absence of oceanographic measurements, using just satellite images? 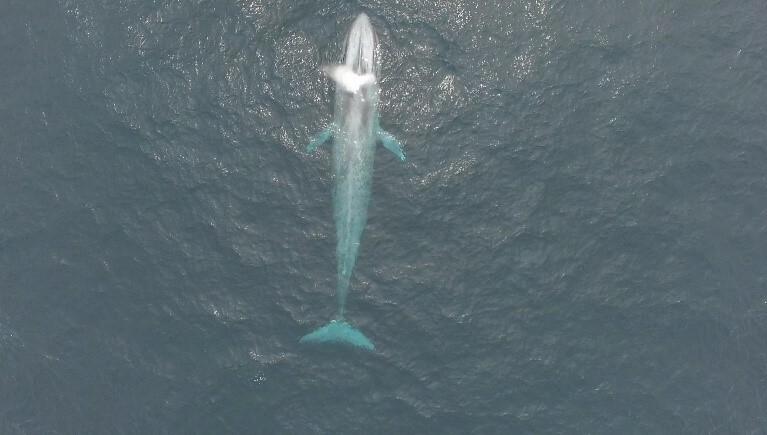 Next, we’ll bring the blue whales back into the picture to ask: can we predict blue whale distribution based on our in situ measurements of oceanography and prey? And finally, in the absence of in situ measurements (which is most often the case), can we forecast where the whales will be based just on remotely-sensed images of the region? 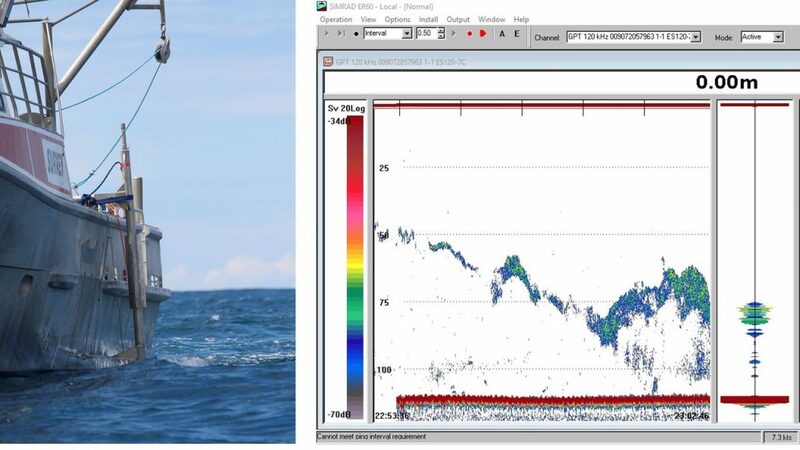 The transducer pole in the water off the RV Star Keys (left) deployed with the echosounder to collect prey availability data, including this image (right) of krill swarms near feeding blue whales. Photo by Leigh Torres. So, cloudy with a chance of whales? Well, you’ll have to stay tuned for that story in the coming months. In the meantime, I can tell you that as daunting as it is to aggregate so many data streams, each step of the way has a piece of the story to tell. I can’t wait to see how it falls together, both from an ecological modeling perspective and a conservation management objective. 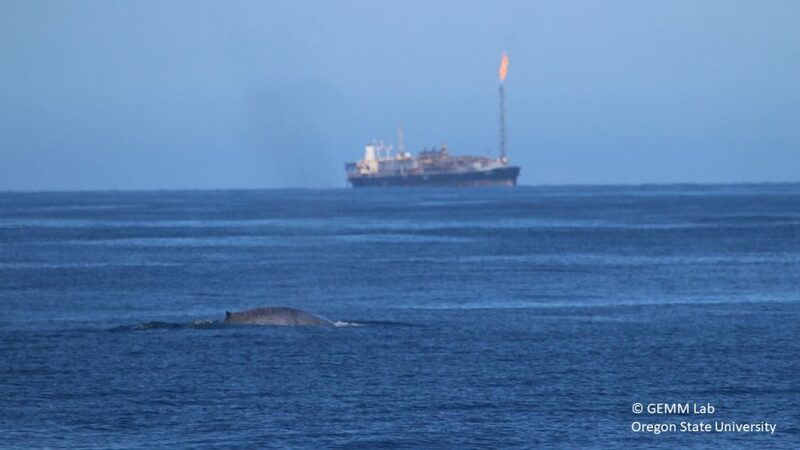 A blue whale surfaces in front of a floating production storage and offloading (FPSO) vessel which services the oil rigs in the South Taranaki Bight. Photo by Dawn Barlow. Torres, L. G. (2013). Evidence for an unrecognised blue whale foraging ground in New Zealand. New Zealand Journal of Marine and Freshwater Research, 47(2), 235-248. Barlow, D. R., Torres, L. G., Hodge, K. B., Steel, D. Baker, C. S., Chandler, T. E., Bott, N., Constantine, R., Double, M. C., Gill, P., Glasgow, D., Hamner, R. M., Lilley, C., Ogle, M., Olson, P. A., Peters, C., Stockin, K. A., Tessaglia-Hymes, C. T., Klinck, H. (in press). 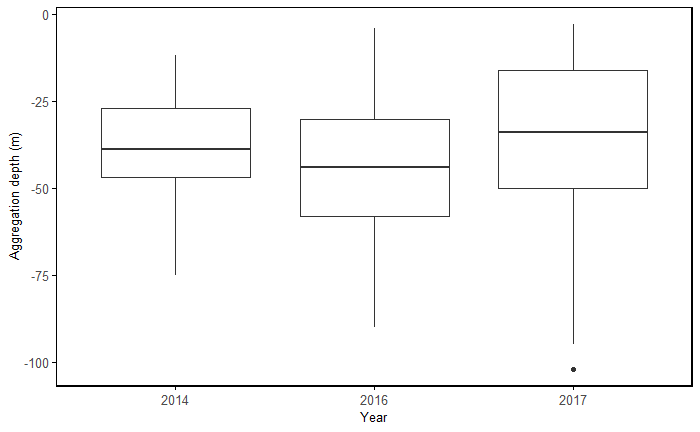 Documentation of a New Zealand blue whale population based on multiple lines of evidence. Endangered Species Research. A few weeks ago, my labmate Dom’s blog reminded me that it is important to step back from the data and appreciate the magnificence of the animals we study from time to time. I have the privilege of studying the largest creatures on the planet. When people hear that I study blue whales, I often get a series of questions: Just how big are they, really? How many are there? Where do they migrate? Where do they breed? Despite the fact that humans hunted blue whales nearly to extinction [1,2], we still know next to nothing about these giants. The short answer to many of those questions is, “Well we don’t really know, but we’re working on it!” Which brings me back to taking time to marvel at these animals for a bit. Isn’t it remarkable that the largest animals on earth can be so mysterious? 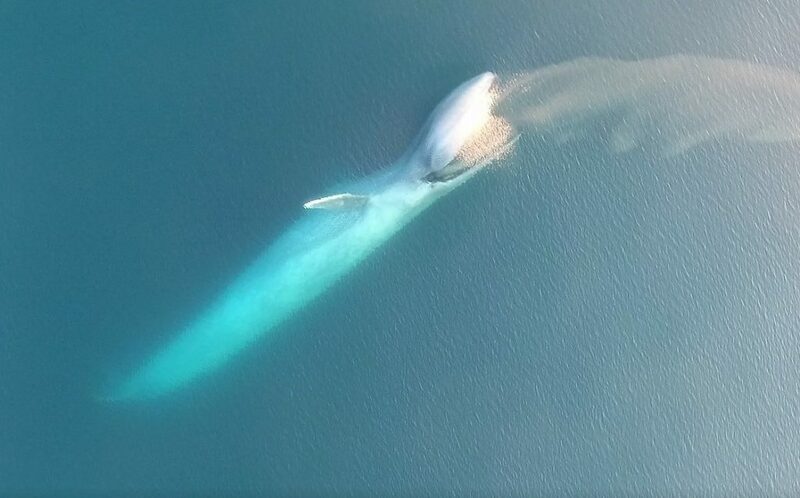 A blue whale comes up for air in a calm sea. Photo by Leigh Torres. 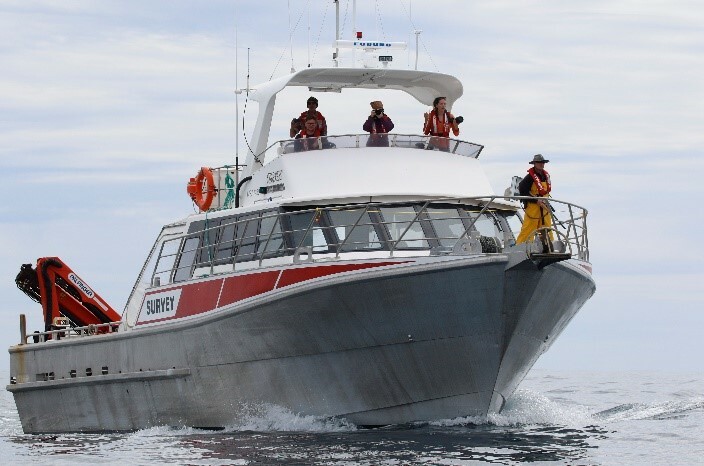 Last year at this time we were aboard a research vessel in New Zealand surveying for blue whales and collecting a myriad of biological data to try and glean some insight into their lives. This winter I am processing those data and conducting a literature review to get a firm grasp on what others have found before about blue whale foraging and bioenergetics. On any given Tuesday morning Leigh and I can be found musing about the mechanics of a baleen whale jaw, about what oceanographic boundaries in the water column might be meaningful to a blue whale, about how we might quantify the energy expenditure of a foraging whale. Here are some of those musings. 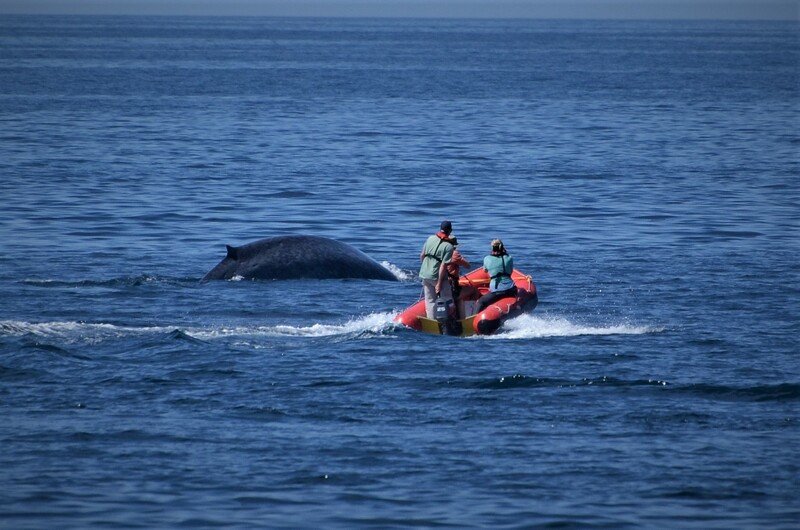 Approaching a blue whale in a rigid-hull inflatable boat for data collection. UAS piloted by Todd Chandler. Humans are, for the most part, terrestrial creatures. Even those of us that would prefer to spend most of our time near, on, or in the water are limited in what we can observe of marine life. Much of the early data that was collected on blue whales came from whaling catches. Observations of anatomy and morphology were made once the whales were killed and taken out of their marine environment. This was not long ago—Soviet whaling continued into the 1970’s in New Zealand . Because baleen whales are long lived (exact age unknown for blue whales but a bowhead whale was estimated to be at least 150 years old ) it is entirely possible that blue whales living today remember being hunted by whalers. Observing whales in their natural state is not easy, particularly post-commercial whaling when they are few and far between. 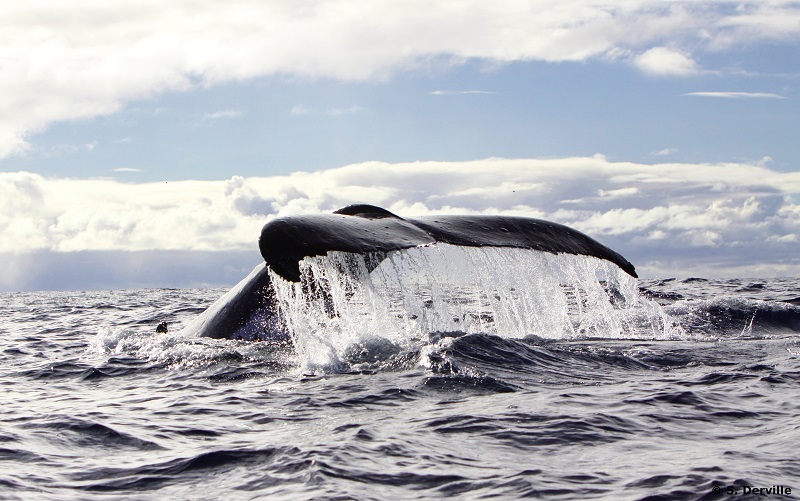 What does a whale do when it is below the surface, out of sight of our terrestrial eyes? A study from 1986 that attempted to calculate the prey demands of a whale assumed that whenever a whale was submerged, it was feeding . A big assumption, but a starting place without any dive data. 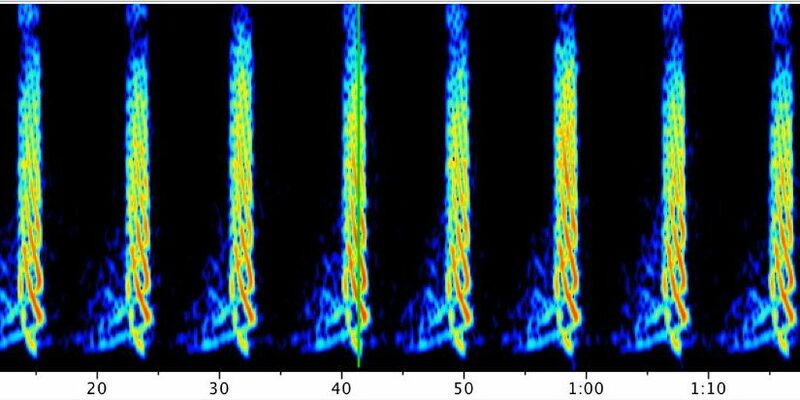 By 2002, tags equipped with time-depth recorders (TDR) had already revealed that blue whales make dives of variable depths and shapes . But, what determines a whale’s path underwater, where they must conserve as much oxygen as they can while finding and exploiting patches of prey? 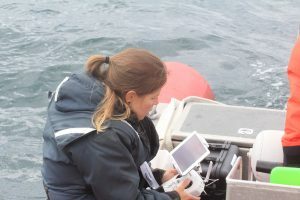 The advent of digital acoustic recording tags (DTAGs) in the early 2000s have allowed scientists to measure the fine-scale movements of whales in three dimensions . These tags can capture the kinematic signatures (based on pitch, roll, and yaw) of lunge-feeding events below the surface. And with the addition of echosounder technology that allows us to map the prey field, we can now link feeding events with characteristics of the prey present in the area . 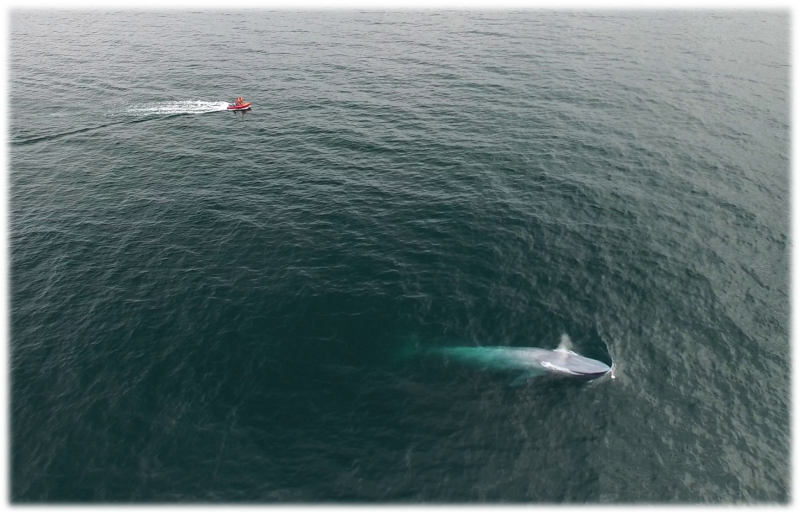 With this progression of technology, curiosity and insight we now know that blue whales are not indiscriminate grazers, but instead pass up small patches of krill in favor of large, dense aggregations where they will get the most energetic bang for their buck. A blue whale shows its fluke as it dives deep in an area with abundant krill deep in the water column. Photo by L. Torres. The advent of unmanned aerial systems (UAS, a.k.a. 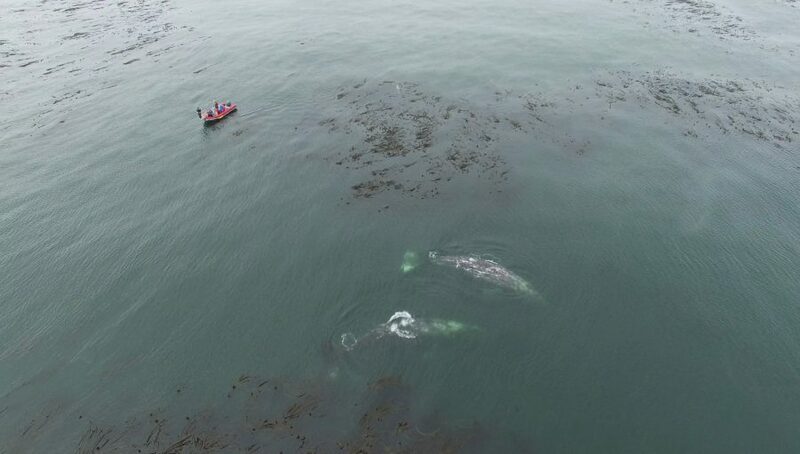 “drones”) have provided yet another unique perspective on the lives of these whales. In 2016, our New Zealand blue whale team recorded nursing behavior between a mother and calf. In 2017, we were able to capture surface lunge feeding behavior from an aerial perspective, both for the first time. A blue whale lunges on an aggregation of krill. UAS piloted by Todd Chandler. Through innovative approaches, we are beginning to understand the lives of these mysterious giants. As is true for many things, the more we learn, the more questions we have. 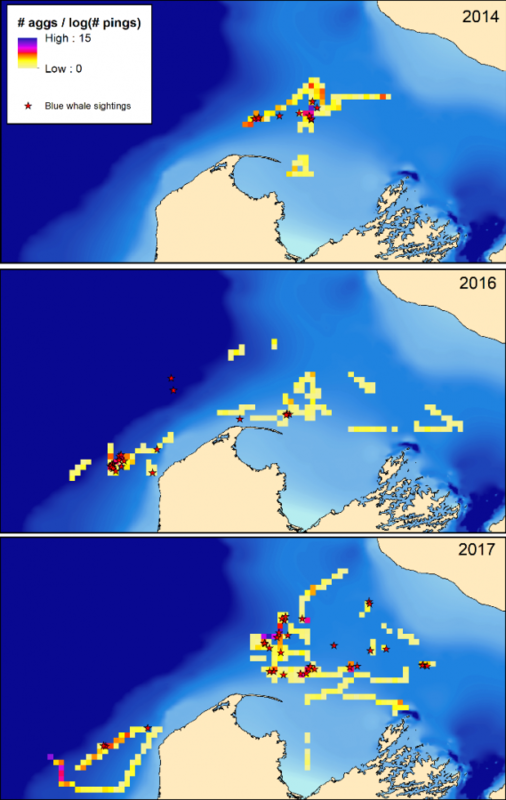 Through the GEMM Lab’s blue whale project, we have determined that a unique population of blue whales occupies the South Taranaki Bight region of New Zealand year-round; they do not simply migrate through as their current threat classification status indicates . But what are their distribution patterns? 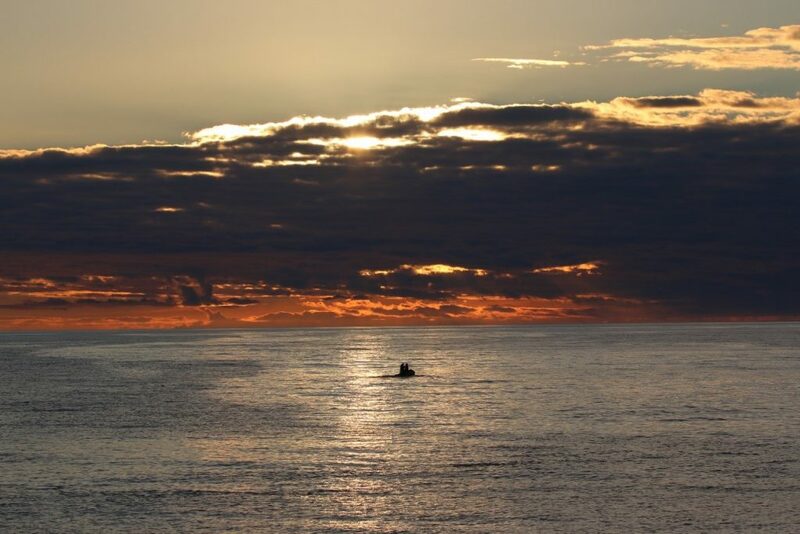 Can we predict when and where whales are most likely to be in the South Taranaki Bight? Does this population have a different foraging strategy than their Californian, Chilean, or Antarctic counterparts? These are the things we are working on unraveling, and that will aid in their conservation. In the meantime, I’ll keep musing about what we don’t know, and remember to keep marveling at what we do know about the largest creatures on earth. A blue whale mother and calf surface near Farewell Spit, New Zealand. Photo by D. Barlow. Clapham, P. J., Young, S. B. & Brownell Jr., R. L. Baleen whales: conservation issues and the status of the most endangered populations. Mamm. Rev. 29, 37–60 (1999). Branch, T. a, Matsuoka, K. & Miyashita, T. Evidence for increases in Antarctic blue whales based on baysian modelling. Mar. Mammal Sci. 20, 726–754 (2004). Branch, T. A. et al. Past and present distribution, densities and movements of blue whales Balaenoptera musculus in the Southern Hemisphere and northern Indian Ocean. Mammal Review 37, 116–175 (2007). George, J. C. et al. Age and growth estimates of bowhead whales (Balaena mysticetus) via aspartic acid racemization. Can. J. Zool. 77, 571–580 (1998). Sears, R. et al. 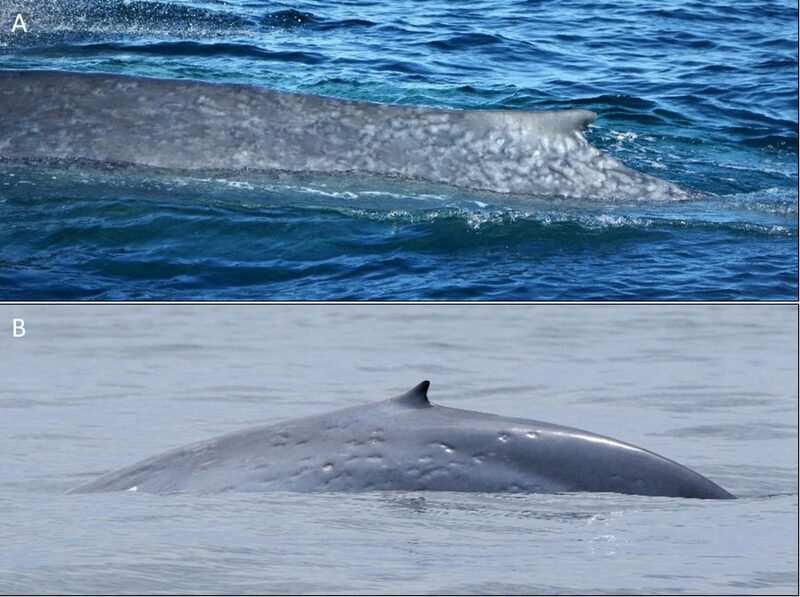 Photographic identification of the Blue Whale (Balaenoptera musculus) in the Gulf of St. Lawrence, Canada. Report of the International Whaling Commission Special Issue 335–342 (1990). Kenney, R. D., Hyman, M. A. M., Owen, R. E., Scott, G. P. & Winn, H. E. Estimation of prey densities required by Western North Atlantic right whales. Mar. Mammal Sci. 2, 1–13 (1986). Acevedo-Gutierrez, A., Croll, D. A. & Tershy, B. R. High feeding costs limit dive time in the largest whales. J. Exp. Biol. 205, 1747–1753 (2002). 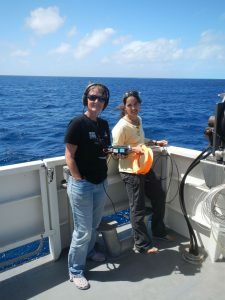 Johnson, M. P. & Tyack, P. L. A digital acoustic recording tag for measuring the response of wild marine mammals to sound. IEEE J. Ocean. Eng. 28, 3–12 (2003). Hazen, E. L., Friedlaender, A. S. & Goldbogen, J. A. Blue whales (Balaenoptera musculus) optimize foraging efficiency by balancing oxygen use and energy gain as a function of prey density. Sci. Adv. 1, e1500469–e1500469 (2015). Baker, C. S. et al. Conservation status of New Zealand marine mammals, 2013. (2016). The GEMM Lab is Conference-Bound! Every two years, an international community of scientists gather for one week to discuss the most current and pressing science and conservation issues surrounding marine mammals. 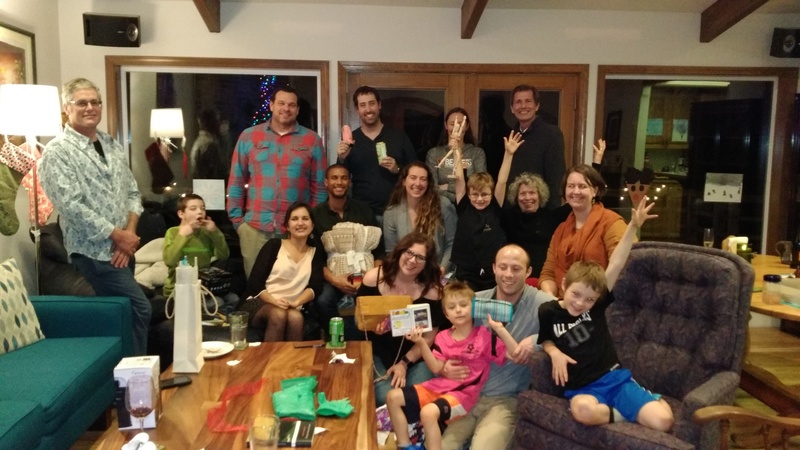 The thousands of attendees range from longtime researchers who have truly shaped the field throughout the course of their careers to students who are just beginning to carve out a niche of their own. I was able to attend the last conference, which took place in San Francisco in 2015, as an undergraduate. 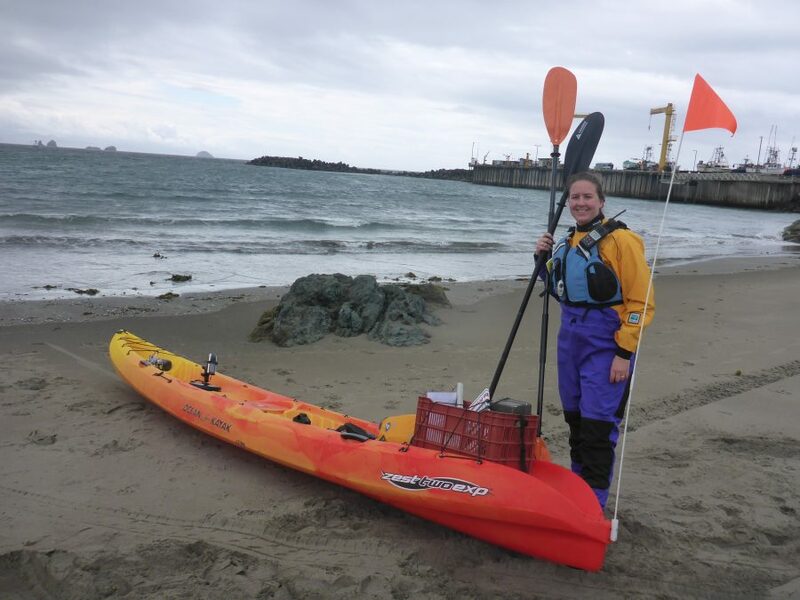 The experience cemented my desire to pursue marine mammal research in graduate school and beyond, and also solidified my connection with Leigh Torres and the Geospatial Ecology of Marine Megafauna Laboratory, leading to my current enrollment at Oregon State University. 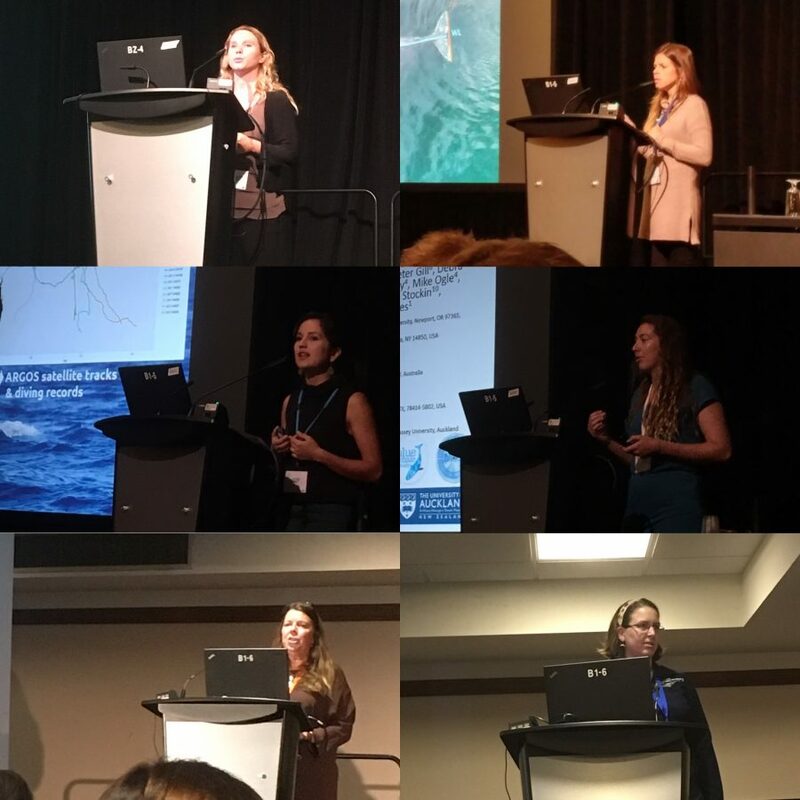 This year, the 22nd Biennial Conference on the Biology of Marine Mammals takes place in Halifax, Nova Scotia, Canada. At the end of this week, Florence, Leila, Amanda, Solene, Sharon and I will head northeast to represent the GEMM Lab at the meeting! 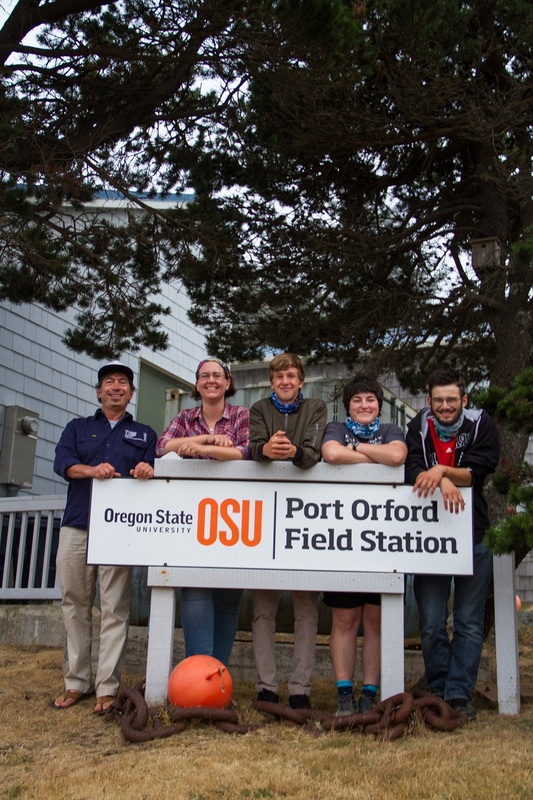 Additional Oregon State University students presenting at the conference will include Michelle Fournet, Samara Haver, Niki Diogou, and Angie Sremba. We are thrilled to have such good representation at a meeting of this caliber! As you may know, we are all working on building the GEMM Lab’s social media presence and becoming more “twitterific”. So during the conference, please be sure to follow @GEMMLabOSU on twitter for live updates. Stay tuned! 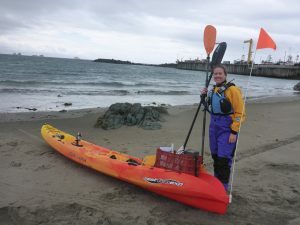 Posted on October 16, 2017 October 16, 2017 Author Dawn BarlowCategories Current Projects, Gray Whale Foraging Ecology and Vessel Disturbance, Impacts of ocean noise on gray whales, New Zealand blue whales, OutreachTags Amanda Holdman, blue whale, Cetaceans, Collaborative Research, Dawn Barlow, drone, Florence Sullivan, foraging ecology, Gray Whales, Habitat, Harbor Porpoise, Humpback whales, Leila Lemos, Marine Mammals, New Zealand, Oregon Coast, Science, Solène DervilleLeave a comment on The GEMM Lab is Conference-Bound!